Richard Senate's Top Thirteen Haunted Places in Southern California and where you can spot a ghost. Richard Senate's Top Thirteen Haunted Places in Southern California and where you can spot a ghost! 13. The Whaley House in Old Town San Diego. Whaley house ghost photos happen all the time! The very haunted Whaley House is located in Old Town San Diego. This 1850s brick house has long been listed as a haunted spot and it lives up to its ghostly reputation. Both the inside and out is haunted so even if you don't get to go inside a trip to the place to walk the grounds. Besides that there is a great Mexican Restaurant across the street with hand made tortillas. Just down the street is the old San Diego Cemetery called the Campo Santo where a number of people have seen ghosts. At the Whaley House bring a tape recorder for stray ESP and a good nose for the scent of cigars that is found in the place. Keep a good eye out in the court room and the stairway were many people feel a choaking around the neck. The Music Room and the old master bedroom has many accounts of ghost sightings. Thomas Whaley in his frock coat haunts as does his wife and daughter. There is a curious apparition of a little scotty dog seen inside and out by ghost hunters. A great place to spend the afternoon. Best time to vist--just before they close or when they first open. 12. Mission San Juan Capistrano. There are much more than swallows here at the old Spanish Mission. The place was the scene of a massive earthquake in 1812. The shaker hit right in the middle of Mass, causing the stone church to cave in. The Padres said it was angelic intervention that resulted in only 42 deaths. But, the ghosts are still there. A ghost woman has been seen in the gift shop and in the chapel. The cemetery is also haunted with many reports of EVP --some in English, some in Spanish. Even the bells are haunted and are said to ring by themselves when a member of the local Native American Tribe (all good Catholics) dies. 11. Aramagosa Hotel, Armagosa ghost town. This tiny community has many stories of ghosts and the old hotel has several stories that will cause a shiver or two. Recently the focus of the TV show Mind Freak, it is at last getting the recognition it deserves. Its in the middle of the Mojave Desert and a quieter place you can't find but, be warned, they do not have air conditioning so visit in early Spring or Fall. The theater is also haunted. This cemetery is the final resting place for the greats of Hollywood's Golden Age. A few are still around, so it seems. Rudolph Valentino has been seen near his cript as well as the ghost of Clifton Webb. Other sightings, cold spots etc.. are found all over. Pay attention to the grave of forgotten actress Virginia Rappe where a sad ghost has been seen weeping. You can pick up a map of the stars graves at the flower shop at the entrance to the cemetery. Buy a rose for your favorite Star and place it upon his or her burial site. 9. The Glen Tavern Inn. This Santa Paula Hotel and restaurant is well documented as being haunted and can provide visitors a chance to sleep with a ghost. Over the years many stars came to the Inn. Even Harry Houdini spent a night at the place. The best known ghost was a member of a silent movie western company who wears a beard and buckskin jacket. He was shot in the Inn in the mid 1929s. He likes to hang out in the ladies bathroom off the lobby and the staircase. Room 222 and 224 have ghosts as well. Phantom children are seen and heard as well as a French Perfume lady who died here suddenly. She is detected by her sweet scent. Leonis Adobe, Calabassas is now a modern town but for years it was just a gas station and a restaurant. The restaurant is still there are serves great food. Next door is the historic Leonis Adobe, now a house museum. It has several ghosts in the old two-story building and grounds. Miguel Leonis haunts the bedroom where he died and his widow, Espiritu, haunts the balcony all dressed in Black. The Stagecoach Inn, now a museum in Newbury Park, next to Thousand Oaks, has a persistent ghostly man. He was identified by Hans Holzer and Sybil Leek as a basque sheepman named Pierre Duvon. Legend says he was shot down in the inn by angry cowboys who hated all things conected to sheep. Pay close attention to the second floor and the family bedroom. There is a haunted crib where odd things happen and a haunted mirror. The old Victorian Carlo Hain House is now a popular steak house now but, since 1969 people have seen a ghost woman here. She is called Rosa and is said to have taken her own life in what is now the ladies bathroom. Many of the witnesses are women naturally. She is seen on the stairs as well as next to the old fireplace. She wears a pink dress sometimes and other times green and blue. Many comment that her neck is very long. It is reported she hanged herself. Very active ghost and the food here is great. The Big Yellow House, Summerland, California was founded by spiritualists as a colony. The largest home is now a restaurant and it has several ghosts. The best known in Hector who haunts the basement and the upstairs library. There is also a ghost lady in 19th Century dress in the woman's bathroom on the first floor. Do try for EVP here and I must recomend the breakfasts here. All of Summerland has stories of ghosts. For years locals called the town "Spookville". 3. La Prisima Mission, Lompoc. Now a restored complex of adobe buildings it is called the "Williamsburg of the West." It is well haunted with at least nine ghosts, if not more, haunting here. Many may well be linked to the 1824 battle that pitted Spanish/Mexican Troops againts Native American Rebels. The priests quarters are reported haunted by a phantom padre. There are reports of ghost dogs, lean greyhounds, as well as a classic women in white. The best place for ghost hunting is the old church and the weaving room. Many EVP sounds picked up here including a specteral flute. This road has no fewer than 12 ghosts here, maybe even 13. The best known of the ghosts are: A black garbed headless horseman, A Ghost school bus from 1930s, Three floating lights, a headless motorcyclist (new take on an old story) and Char-Man! Char-Man died in a fire set by teens in the 1950s and now walks Creek Road (a lover lane) where he frightens and attacks teenagers. He hated Rock and Roll music and such toons from the 1950s will bring him out. Many of the sightings take place on or near the bridge at Camp Comfort. The RMS Queen Mary, in Long Beach, California. For my money the best place in the USA to see a ghost. Spend a night on the old ship and walk her decks between the hours of 2 to 4 am. Ghosts seem almost natural. Do check out the fantail (stern) medical rooms and the old pool room. The ghost of John Pender haunts the engine room where he died in a freak accident. The forward lounge is also haunted as is the bow where the ship rammed another craft in World War Two. Many of the haunted cabins are on "M" Deck. Try to go mid-week if you can. The ghosts only come out when its quiet. Try for orbs here as well but be warned! once something jerked a camera out of my hand here and smashed it. My wristwatch broke at the same time--the spring inside twisted into a knot! One of the top ghost investigators of our generation. 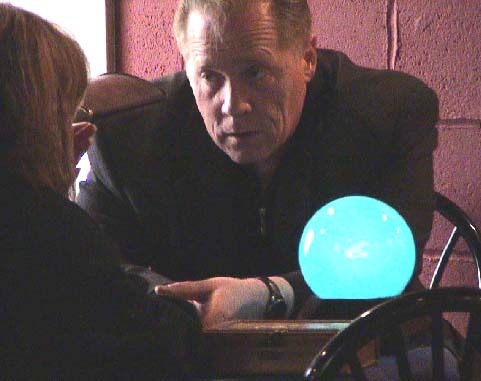 He is an "Historian And Ghost Stalker" author of several prominent books on ghosts and paranormal phenomenon, and has appeared on just about every paranormal television and radio show there is. PLEASE VISIT TO READ MORE HERE! Also visit Richard Senates Web Site here now!